Fast, healthy, gourmet meals may seem too good to be true, yet Raymond Blanc's award-winning cooking has always been let by light, unmasked flavors and fresh organic ingredients. 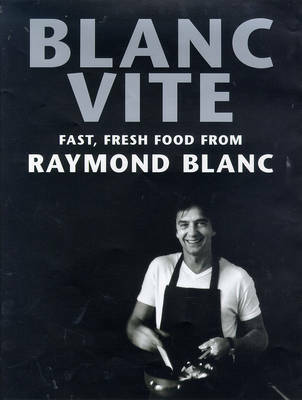 Now, in Blanc Vite, he presents a selection of dishes from his famed restaurant La Manoir aux Quat' Saisons. Among the recipes are poached eggs on a bed of asparagus and spinach; a salad of chicken livers, lentils and orange; pasta with Swiss chard, goat's cheese and artichokes; grilled tuna with borlotti beans and salsify; and grilled figs with raspberries and port. Working with consulting physician Dr. Jean Monro, Blanc outlines the principles of eating one's way to excellent health, making this essential information both lively and easy to digest. Celebrating the freshest, purest foods, he rewrites old ideas of bland, uninspired health food, offering a wholesome cuisine that is as sensual as one would expect from Raymond Blanc - and surprisingly easy to prepare.